It’s easier than you think.Steve G. Jones, Ed.D., Clinical Hypnotherapist, charges $1,500 for a custom recording and $25,000 for a one-hour private hypnotherapy session at his office. But you can get all the benefits for this low price. Simply listen to the Writer’s Block Hypnosis MP3 every night as you go to bed for three weeks and feel the changes happening in your life. You will feel more empowered, more in touch with your true self, and you will truly know that your goals are within your reach. This is the same hypnotic technique he uses with busy professionals, Hollywood actors, and people like you who are ready for a positive change NOW! Steve G. Jones achieves AMAZING and LASTING results!!! Hypnosis is the easiest way to affect change in your life because the positive messages go straight to your subconscious mind effortlessly so you can accomplish your goals and reach for the stars!! All you have to do is listen to the Writer’s Block Hypnosis MP3 session at night as you go to sleep!!! You’ll hear soft music, the gentle sounds of the beach, and the soothing sound of Steve G. Jones’ voice all working together to bring about positive changes in your life easily and naturally. Steve G. Jones has been helping people improve their lives with hypnosis for over 17 years…now it’s time for him to help YOU… don’t wait, do it NOW !!! you’ll be glad you did. See you at the top! And as you continue relaxing deeper, deeper and more deeply relaxed, I would like you now to imagine that project which you would like to work on and if your have several, just imagine one, one writing project. And see yourself sitting down in front of your computer or wherever you write, perhaps you write on paper or perhaps you write on the computer, but however and wherever you write, imagine yourself there now. And as you look at the screen or the paper, I want you to imagine seeing right through what you are looking at. It’s as if a small dot is forming at the center of the screen or the paper and opening up slowly. Now it is the size of a quarter. Now it is the size of a tennis ball. The dot continues to grow as this opening in the screen or the paper continues to grow. Now it is the size of a basketball. Now it overtakes the entire screen or paper, this hole that is opening. This is a window which is opening. Through this window you can see many ideas which are in your mind. As you now look through that window, through that portal, you can see many ideas floating around, moving around. They are dynamic and colorful and very active ideas. Perhaps they are words or events or people or shapes. Perhaps you hear things coming from there. Perhaps you only see things. Perhaps you feel things coming from there, through that portal. You are very tuned in now to those ideas, to those concepts flowing now freely as they now move out through that portal into the room in which you are sitting. And you see people moving and talking. You see objects moving. You see wonderful ideas. You see words forming. It’s as if you are surrounded by magic. You see things all around you, filling the room you are in, flowing out of the portal and filling the room you are in. and you realize that any time you sit down to write whether on a piece of paper or on the computer, ideas flow out through the portal into the room in which you are sitting. And if you are outside, they flow outside to be near you, to surround you, these wonderful, amazing ideas. And this happens automatically when you sit down to write. This is an automatic process. First you perceive in your mind the dot on the screen or paper and then it grows in size radiating outward a circle growing until it takes over completely the page or the computer screen. And then ideas begin to flow out from it. First you see the ideas inside the portal as if you are getting a glimpse of another world through the portal. And then the ideas begin to flow out from the portal toward you, filling the room you are in or if you are outside they surround you. Ideas floating around you everywhere. And you are easily able to gather these ideas and write about them. So now see yourself writing either with pen, pencil, or a keyboard or perhaps you see yourself recording these ideas on a recording device. You simply begin recording these ideas in the way you choose to record them. Notice the more you record, the more they flow. You let yourself go. You let yourself record these ideas either by typing them, writing them or recording them. You capture these ideas. See yourself capturing them now. Let go of criticism, just capture these ideas. Editing can happen later. Right now just focus on capturing, capturing these ideas, that’s right good. And every time you sit down to write this process will happen automatically. The ideas will flow through the portal and you will capture them. You are being given a direct command to let go of any filters and just capture the ideas. Editing happens later. Right now you are just focused on capturing, good. And day by day as you listen to this recording, your powers are tuning into the ideas in this portal, they grow in intensity so that very soon indeed you will be able to just sit down and suddenly have an amazing array of ideas. Also, your ability to capture these ideas in an unfiltered way will grow in intensity day by day. So very soon indeed you will be able to sit down and capture ideas, that’s right. See yourself capturing even more ideas. And perhaps tomorrow when you wake up you will have some wonderful ideas right away which you will immediately write down because one of the ways you capture ideas is simply by waking up and recalling your dreams. You capture these ideas freely without filtering. So you capture ideas when you wake up, immediately capture them and you capture ideas when you sit down to write. And this ability of yours is improving day by day because you are an amazing writer. You are an amazing writer. You are an amazing writer. This powerful hypnosis session will put you into a deep state of relaxation as positive affirmations are delivered to your subconscious mind. Hypnotherapy will help you overcome writer’s block so that you are overflowing with ideas on which to write about. Your subconscious mind is in charge of all the creative processes that go on in your mind. Creativity and new ideas are infinite in number, so it is just a matter of time before those ideas come forth in your mind. 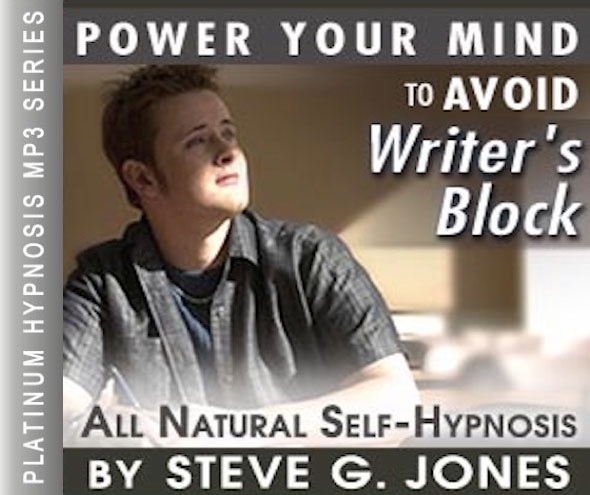 The Writer’s Block Hypnosis MP3 audio speeds up this process of finding new and creative things to write. The ideas are already in your mind, you just have to learn how to access them whenever you want. 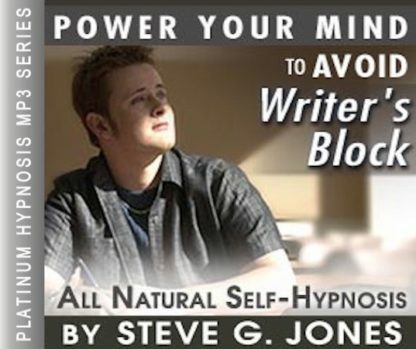 You will no longer have to deal with writer’s block when you listen to the Writer’s Block Hypnosis MP3 recording. You will learn how to retrieve an endless amount of ideas in just 21 day of listening this recording. We suggest that you listen to the recording before going to bed, as you will be suggested to fall asleep at the end of the recording. We also suggest that you listen to the Writer’s Block Hypnosis MP3 session on a weekly or monthly basis after the initial 21 nights, as a maintenance plan to keep the creative ideas coming at a constant rate.